Hi! My name is Sarah Asiedu and I am so proud and grateful to be able to say that I participated in the Yallah Commit to Action program which gave me the special opportunity to discuss my passion in two great leadership conferences. To this day,, I still remember when my Arabic teacher first talked about the program. 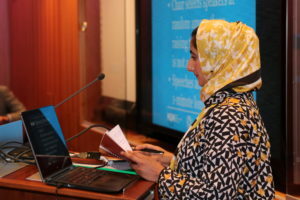 As she was describing the program, I could was think about was my project on education inequality. I did not expect to make the program, but of course I still applied anyways. After I received my acceptance, I was so happy and could not wait to finally be trained as a future leader. 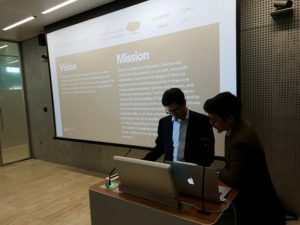 Throughout the several weeks in the Yallah Commit to Action program, I was taught on how to properly make an effective project which would focus on my chosen community. Through this process, I was able to form a group with people who shared the same passion as me! With the help of our lovely mentor, Jennifer, we established a project and were selected to go to Disneyland and present at the NYLC youth leadership conference. In this moment, I was proud of myself because not only did I speak in front of a big audience but I was able to make my point on how countless children in West Africa are deprived of a proper education – an issue that can prolong the poverty cycle and prevent economic growth. Little did I know that I would get an even bigger opportunity in October to present at the THIMUN Qatar leadership conference. As a person who was born and raised in Los Angeles, California, this was a big deal. Going to this conference meant that I could reconnect with friends and spread my message internationally. Although I was hesitant at first, accepting the offer to go to Qatar was a decision that will forever impact my life. As a leader, it is important to be accustomed to different cultures around the world and that is exactly what I did. I am forever grateful to experience the culture and beauty Qatar offers. In addition, the conference allowed me to interact with other leaders who have done bigger things. 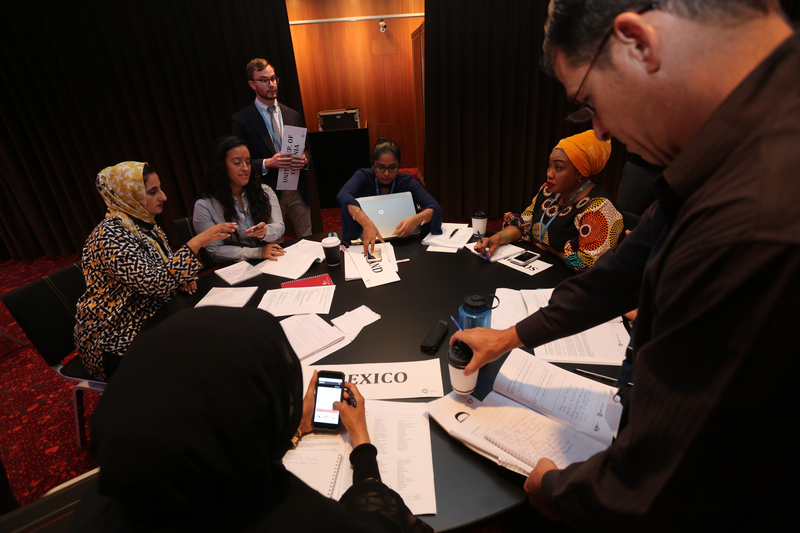 I attended several sessions that varied in topics such as Model UN to the humanitarian crisis in Somalia. I enjoyed my time at the conference because it made me well rounded in learning different topics and issues around the world I would have never thought or imagined were going on. Not only did I get to meet new people I was able to form close relationships with others who would have a tremendous impact on me. Going to the conference only inspired me to do more; it constantly reminded me that as a leader, there is so much for me to do, so many more people to meet, and most importantly, so many more to help. 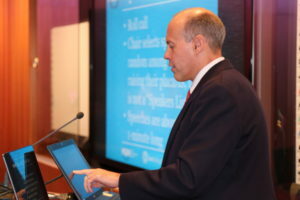 Overall I loved my presentation with my peers in Qatar. We worked so hard and for us to spread our passion internationally meant so much. The audience was so intrigued we knew we wanted to push further. Going to the Qatar Leadership Conference was a spark for me and only motivated me to go further. In the future, I hope to expand my project and ideas to make it more effective. 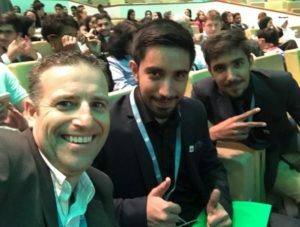 I also hope to (and will) reconnect with my Qatari peers to present in more conferences. This is only the beginning for me. 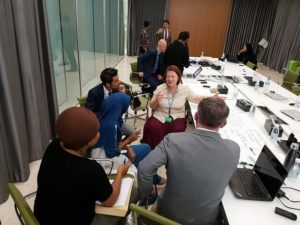 Honour and awe were two emotions I continually felt on my trip to the Middle East as I represented TeachSDGs at the 2017 Qatar Leadership Conference (QLC) in Doha, Qatar. From the moment I hopped on the Qatar Foundation bus taking me to the Qatar National Convention Centre to the final goodbyes from the MUN Thought Leaders’ Summit at the Qatar Foundation Headquarters, I was awed by the amazing individuals surrounding me. 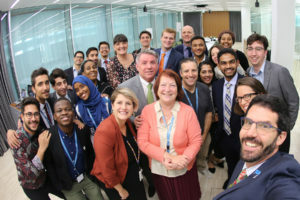 That was impressive enough—though I had suspected that Lisa Martin, the Head of THIMUN Qatar and the heart and soul of the QLC, would gather some remarkable world changers to the conference. 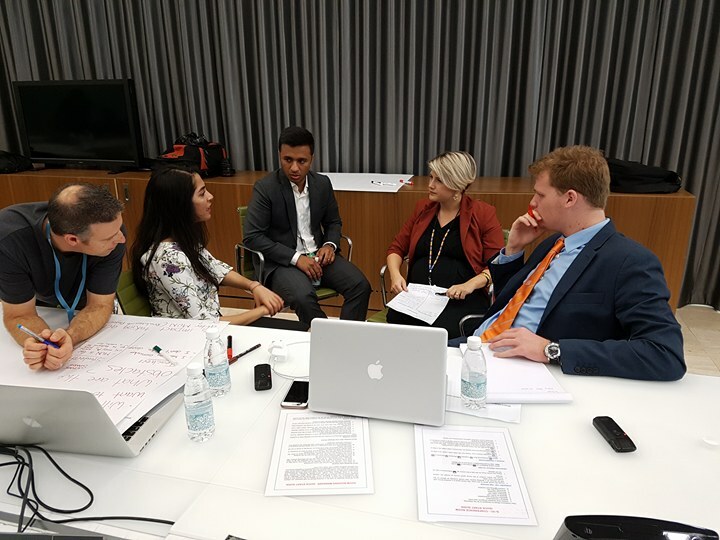 What I didn’t expect was how these influential individuals from across the globe would come together to create a brand new MUN initiative focused on ensuring that MUN would always move beyond simulation to impact. 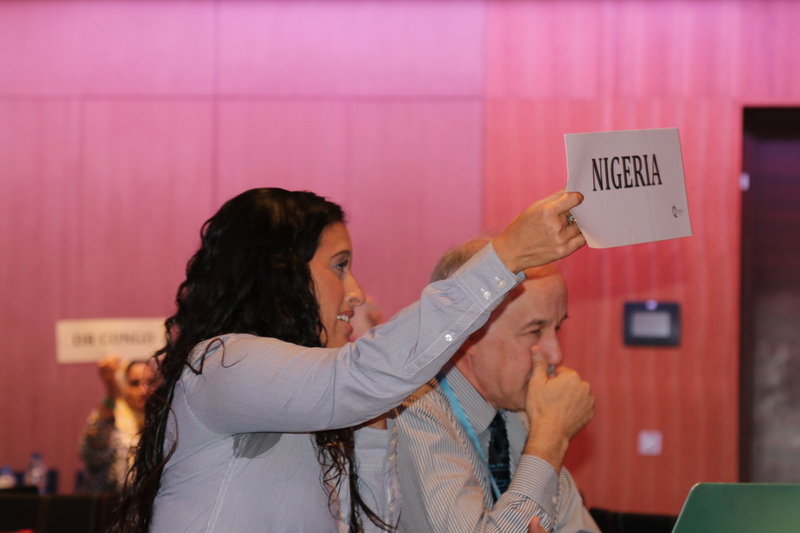 Travelling to this MUN-focused conference from Canada, I was well aware that I lacked the deep knowledge of Model United Nations that others at the conference would have. That didn’t bother me. Always in the back of my mind, it was action that I was to share at the conference. The connections-based learning approach that I use in my teaching is all about action. I don’t want my students to imagine what it is like to compete for a spot to deliver experiments into space. I want them to compete for those spots. I don’t want my students to simply learn the mechanics of water purifiers. I want them to meet real innovators, who are building water purifiers for needy communities, and help them. I don’t want my students to just learn about Ohm’s Law. I want them to make solar powered lanterns that they can share with their learning partners in communities dealing with light poverty. And as part of the Global Goals Educator Task force (TeachSDGs), I am all about action: encouraging and inspiring teachers around the world to take action to help achieve the sustainable development goals (SDGs). 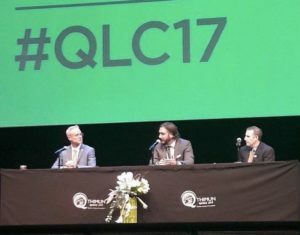 I felt I was at the QLC to speak action into the conference. This was my mindset as I shook off my jetlag and met the other presenters with whom I would be spending the next few days. I was fortunate to connect with Natabara Rollosson, a creative producer for UN high level events who launched Comics Uniting Nations, and Sergio Fernández de Córva, chairman of PVBLIC Foundation, as I hopped on my very first bus ride to the Convention Centre. The three of us were slated to hold a panel sharing “Behind the Scenes” SDG work and I was eager to discuss our approach. Right away, I was impressed. These two individuals had a deep knowledge of the history of the SDGs and how they are being addressed through artistic means. Off the side of his desk, Natabara creates comics to support children understanding and acting on the SDGs. I immediately thought of how TeachSDGs could partner with him to help share the stories of the SDG superheroes Comics Uniting Nations creates. Still in that first bus ride, I turned to a fellow squeezed beside me to make conversation. I introduced myself and listened with ever-growing awe as he explained who he was. Rahmatullah Hamdard offered me his card and shared that he was the founder of HELA (Hope for Education and Leadership in Afghanistan), the first ever MUN NGO. 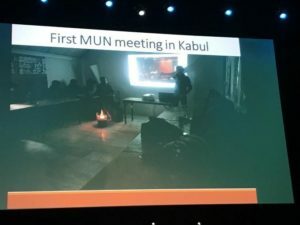 Later he would present to the conference alongside his 19-year-old partner Sulaiman Sulaimankhil pictures of the first Model United Nations meeting in Kabul, in a darkened room heated by a kerosene lamp. And then share how far MUN has come in Afghanistan. What an honour to meet those two. The amazing meetups continued. During the conference I kept meeting two English chaps in the conference hall foyer. We would chat as we waited for the bus back to the hotel. Later I would find out that they travel to Bangladesh and build prosthetic limbs out of old drain pipes for the amputees there. 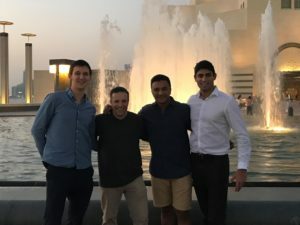 Riding in a taxi with these doctors, Matthew Walton and Zaamin Hussain, to the Museum of Islamic Art, the taxi driver who was from Bangladesh mentioned to that he knew of their work. This is the kind of impact that these two were making. On that same taxi ride, I got to know Aditya Soma, executive director of Worldview Education. He was actually sitting in the front of the taxi translating what the taxi driver was saying about Matt and Zaamin. As I learned more about Aditya, I was impressed by his work to ignite the students of India to take action on the SDGs. The MUN students with whom he works are to be so much more than delegates, but to be advocates, mentors, and organizers involved in service. He mentioned to me how, though MUN can be an expensive endeavour leaving out some for financial reasons, he is working to make MUN freely accessed in India. There were so many more people I was honoured to meet. I was able to spend time with Ugbad Kasim who works with the World Food Program in Somolia. 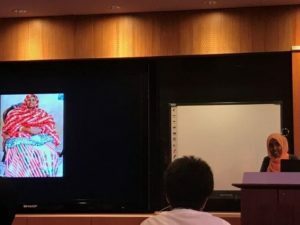 She shared at the conference of the difficulties her and her 7 sisters faced to receive an education growing up in Somalia and the sacrifices her mother made to ensure that her and her sisters were able to go to school. I spent time to with Gilberto Duarte, Crime Prevention and Criminal Justice Officer at the UNODC in Vienna, and Reinhardt Smit who works to recycle end-of-life mobile phones from Africa and Asia. 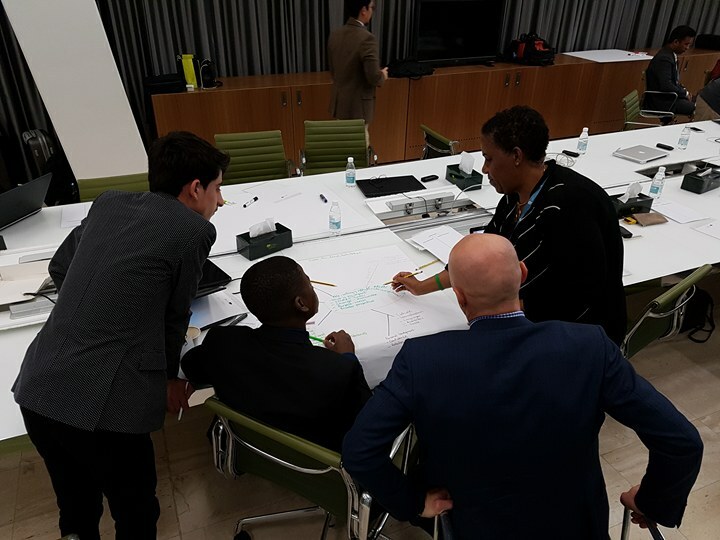 Even the young man who was making sure we all got on to the bus, Kudzai Mukaratirwa, was actually Director of THIMUN OMUN leading a team of 28 high school and university students from around the world to run the Online Model United Nations program. 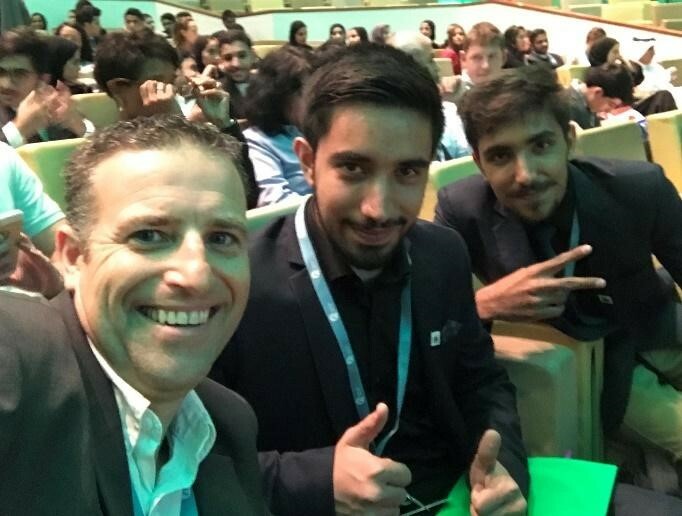 These are just a few of the scores of individuals that gathered in Doha, Qatar to share with the student attendees. Throughout the conference, I sensed that I was in the company of like-minded individuals. I began to realize that I wasn’t there to speak action into MUN, but to add my voice to the growing choir. The voices were there, they were simply needing to align, to sing in harmony. Toward the end of the conference, Lisa brought us together to do just that. The conversation at her SDGs Discussion workshop and the ensuing Thought Leaders Summit revolved around the question: “How do we utilize the power of MUN to make an impact?” Through these discussions, MUNimpact was formed: a collective of world changers devoted to igniting and celebrating MUN impact—both in the individual and the community. The influence of this new offering has already rippled across the globe: a new website, a social media presence, stories of impact, and students and educators wanting to join in. I am excited to see where this goes as we explore the power of gathering the passionate. I am honoured to be numbered a part of this group and in awe of what has and what can be accomplished through us. 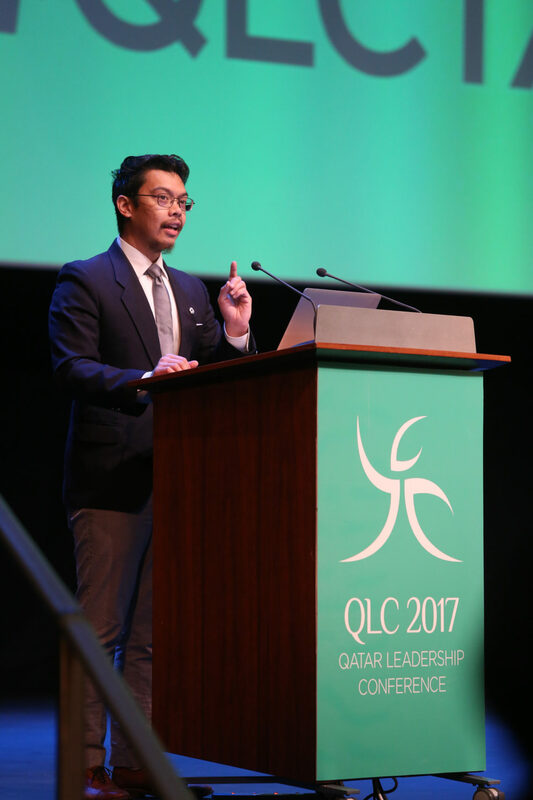 THIMUN Qatar was honored to have Mr Ryan Villanueva, co-founder of Best Delegate and recipient of the THIMUN Qatar Lifetime Achievement Award, as keynoter for the final plenary of QLC 2017. Here is both the video and transcript of that speech. Thank you again to Ryan for his years of service to THIMUN Qatar, and for closing out the conference on such an inspirational note! 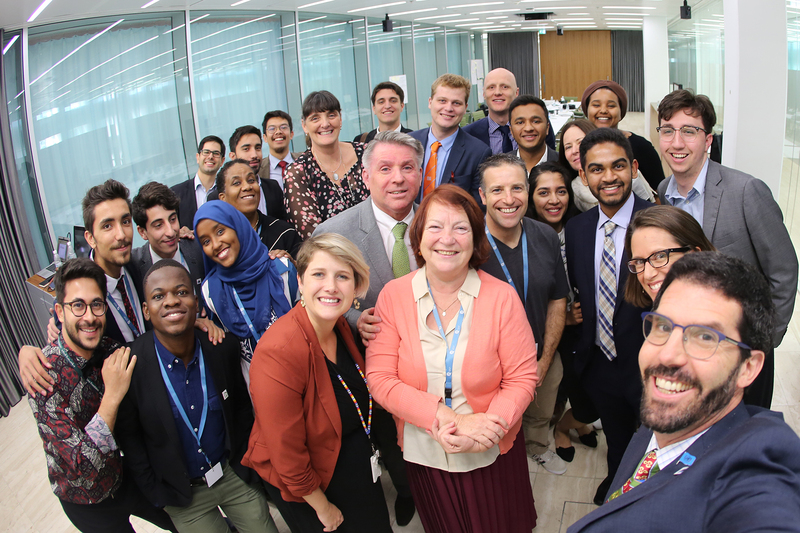 I first want to say congratulations to the Secretary-General, the admin staff and student leaders, and the TQ office for hosting a wonderful conference. Thank you all of your hard work in putting this incredible event together. Secondly, I want to say thank you again for the lifetime achievement award. I was completely surprised and I didn’t know what to say — and I teach public speaking! When I realized what you were about to do, I also realized I had 30 seconds to make up a thank you speech and I kept thinking of what I teach my students: Hook, Point, Action! Seriously though, thank you again, and even though my name is on the award, I see it as recognition of the work that my co-founder, KFC, and I both did when we first started visiting the Middle East and developing teacher training, and recognition of our work at Best Delegate to create global citizens through Model UN. Again, thank you. What is leadership? What does it mean to be a leader? And most importantly, how do we empower today’s students to become tomorrow’s leaders? For me, leadership started with being a Model UN delegate in high school 17 years ago, and learning to lead in committee, learning that “winning” best delegate didn’t mean overpowering other delegates, it meant empowering other delegates; I learned that the best delegate brings out the best in other delegates. I went on to become a chair, and a Secretary-General, and win over $20,000 in college scholarships because of MUN. That helped me get into Yale, where I continued to do Model UN and become Secretary-General of Yale’s conference. And in my senior year of college, when I thought I was done with Model UN, I started a website called bestdelegate.com. That moment was 10 years ago this week. And that one decision has changed the rest of my life. Because I went to work on Wall Street, at Goldman Sachs, during the 2008 global financial crisis. And I did that for two years, and I asked myself, “Is this what I want to do with my life?” And then I quit in order to take this website and turn it into a company. In my experience, leadership comes from creating things that are useful and valuable to other people, whether that’s our website or our trainings. In my experience, leadership means making mistakes, and even failing, but willing to be open to feedback, to pick myself up and improve and get that much better next time. In my experience, leadership means making sacrifices. I went from working on Wall Street to not making a living for a few years. I went from living in NYC to moving back home. And KFC and I wanted to visit a lot of MUN conferences to learn about what makes them different and special and that meant staying with a lot of friends to sleep on a lot of couches and a lot of floors in order to save money. But in my experience, leadership also means not going it alone. I have a co-founder and we complement each other’s leadership styles. We created and empowered teams to run our website, and teach our MUN camps, and manage the company. And we get to work with incredible individuals and educators and partners across the globe. In my experience, leadership means being part of a community and working together and helping each other to get that much better. That’s been my experience with leadership. But here at the QLC, every session, every speech, and every story is a different answer to the core question of the conference, What is Leadership? 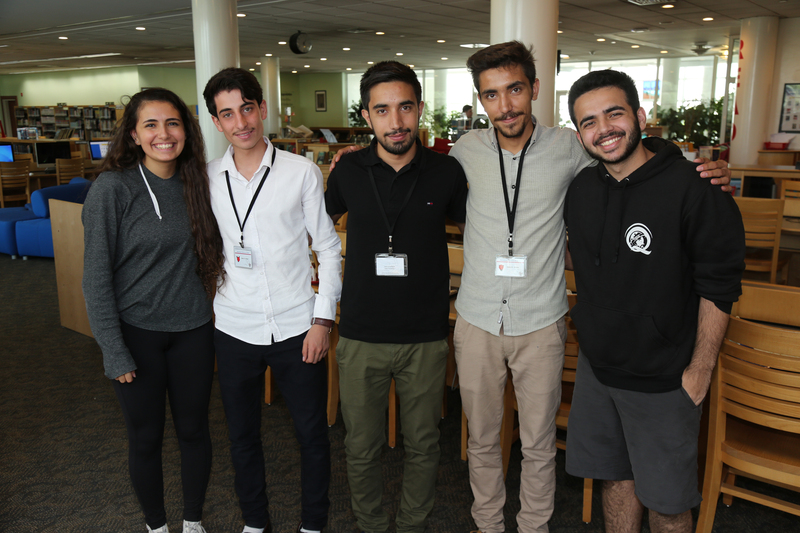 For many of the students here, leadership is waking up on a weekend to work on global issues. Leadership is the shy student getting over their fear of public speaking in order to give that first speech. Leadership is the student officer managing a committee and a conference of their peers.Leadership is a young woman wanting to take this experience back to her people and creating a center that stands for her name: peace. Leadership is a pair of young men fighting daily struggles and security challenges in order to create an NGO that gives their country something it desperately needs: hope. And for many of the educators here, leadership is every day in the classroom, and every weekend where you’re taking time out of your schedules and away from their families in order to take your students to a Model UN conference. Leadership is a group of dedicated educators creating a foundation that would empower student leaders for 50 years and more. 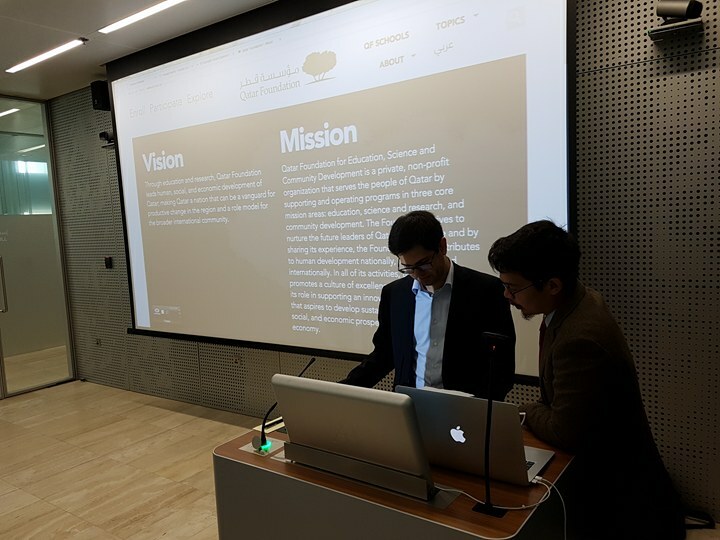 Leadership is a visionary creating partnerships to build an oasis of learning in the Middle East. Leadership is a dreamer who creates a better world where students can connect and empower one and make their own dreams come true. A Leader is a Dream Maker. And this is one of those questions where there’s no single right answer — but there is a wrong answer — and the wrong answer is to do nothing. If you have the privilege of coming to this conference and you go home and do nothing — then you’ve failed. Because coming to a leadership conference does not make you a leader — what you do after the conference — that does. If you’ve listened to all of these amazing sessions, and speeches, and stories — and you are full of energy and inspiration — then do something with it. Try that much harder at your next conference and your next speech. Make mistakes and fail and pick yourself up and get feedback and improve and get that much better. Create something — something useful and valuable that will help other people. Make someone else’s dream come true. Because you don’t have to go it alone. You are part of a community community of people who want to help each other’s dreams come true. Of all the sessions and the speeches and the stories, that’s the one common theme: we lead when we help each other succeed. Hope for Education and Leadership In Afghanistan founder and co-founder, Rahmatullah Hamdard and Sulaiman Sulaimankhil, along with HELA member Hidayet Nooshin, paid a visit to the American School of Doha on October 18th, 2017 in conjunction with their visit to Qatar for #QLC17. The HELA reps had the opportunity to tour the campus, hold a series of meetings with school and MUN club leadership, and visit to an IB Global Politics class, to share their story and drum up support for their upcoming THIMUN Qatar delegation. ASD, as a component of their learning service program, have made a major commitment to support the HELA delegation to attend the annual TQ conference. The Parent Teacher Association, the Arab Mothers Association, and a private donation from Illham Afiouni and her business, My Gym, have largely underwritten travel for HELA, with the TQ office and local hotels providing additional support. On the opening day of the Qatar Leadership Conference, representatives of the ASD PTA, AMA and My Gym, were recognized for support and received small tokens of appreciation from the HELA team. 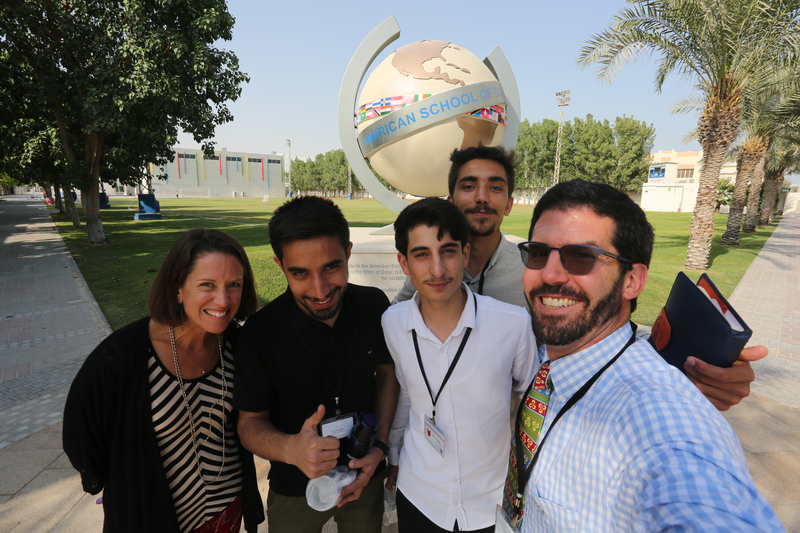 The THIMUN Qatar office is grateful for the generosity of the American School of Doha, teachers- students and parents, and their willingness to support this amazing MUN program. MUN directors get their debate on! 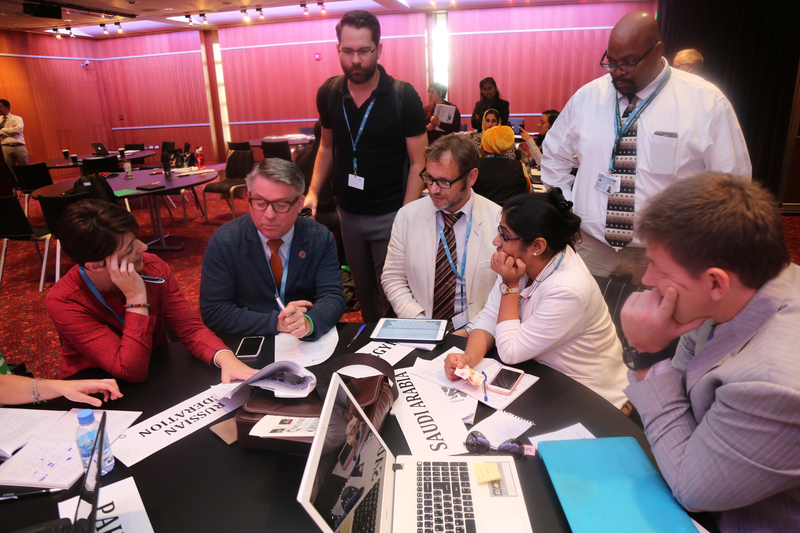 Teachers from across Doha were once again treated to a day and a half of Model United Nations professional development at the Qatar Leadership Conference 2017. 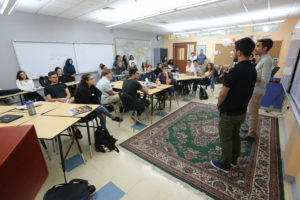 This high quality training, the Director’s Training Institute-developed and delivered by Best Delegate- has been a smash hit over the past four years, training hundreds of MUN teachers and directors in the finer arts of Model UN. One of the highlights of this training is the much anticipated Directors Debate, where teachers have to walk through an entire debate process, start to finish. 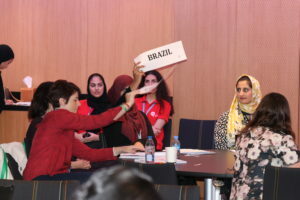 From the look of the photos, our teachers were as engaged as their high school counterparts, giving everyone a personal connection for what MUN delegates experience as they participate in conference proceedings. We congratulate all Director Training Institute participants for jumping in their delegate roles, for learning about MUN, and for the work they do in supporting their clubs and students in the process! 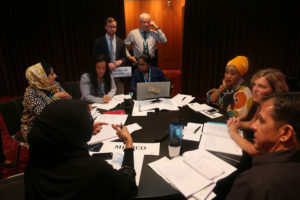 The Model United Nations community is an army of untapped foot soldiers, an enormous community of delegates who care deeply about the role of the UN in the world and the mandates it is tasked with carrying out. The MUN community is, however, a diverse one, with regional, procedural and institutional cultural identities that limits interaction between programs. One thing many MUN programs do care about, no matter their operating procedures or conference structure, is IMPACT: promoting and working to make Model UN impactful for its participants. 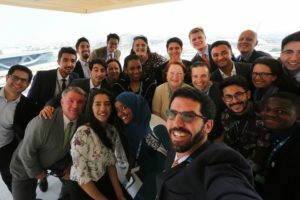 Impact can be personal, at the delegate level and leading to more informed, more skilled and more committed global citizens, or more outward focused, where MUN becomes a driver for community engagement and a commitment to promote and help the UN do its job. 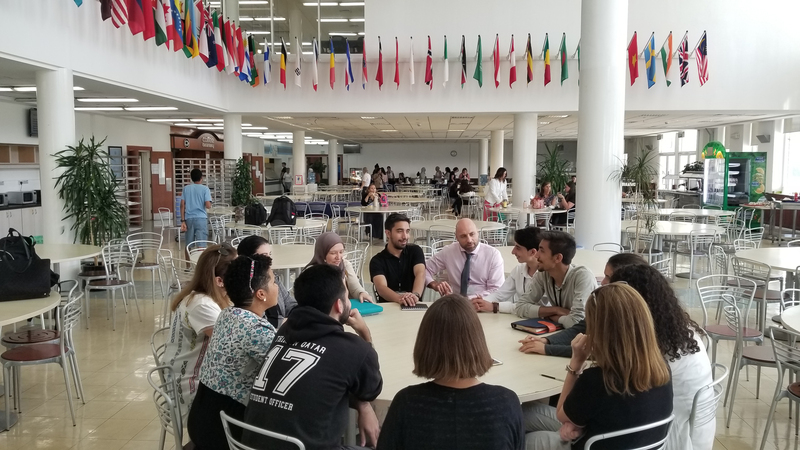 This external focus of IMPACT has many different looks, from a conference measuring food waste and getting participants to change their habits, to a group of MUN delegates who start an NGO in Afghanistan to teach Model UN, women’s empowerment and leadership. MUN programs have been impactful for a long time. MUN Impact, as a community and movement, aims to focus attention on these practices, and to act as a call to arms for all MUN programs to use their communities to put IMPACT at the center of what they do. 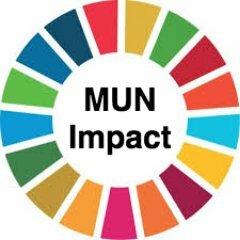 Community: Through our presence on social media, we will rally around #MUNimpact, to share stories of the impactfulness of our programs, and to move a conversation on how impact might help unite us in support of UN mandates and goals, particularly the Sustainable Development Goals. Anyone can jump in, initiate, share or join a conversation on Facebook, Twitter, Instagram, or LinkedIn. Resource Hub: Through a website ( currently in the planning stages), an MUN Impact blog and website will give us a platform to share stories, and to act as a repository for resources to be shared with others. If your MUN club ran a great service project, you can share that idea so that others might adopt it? If you were inspired to start a Peace Center, tell us how that happened? If you made a commitment that your conference would reach out to under-served students to get them involved in MUN, how did you do it? 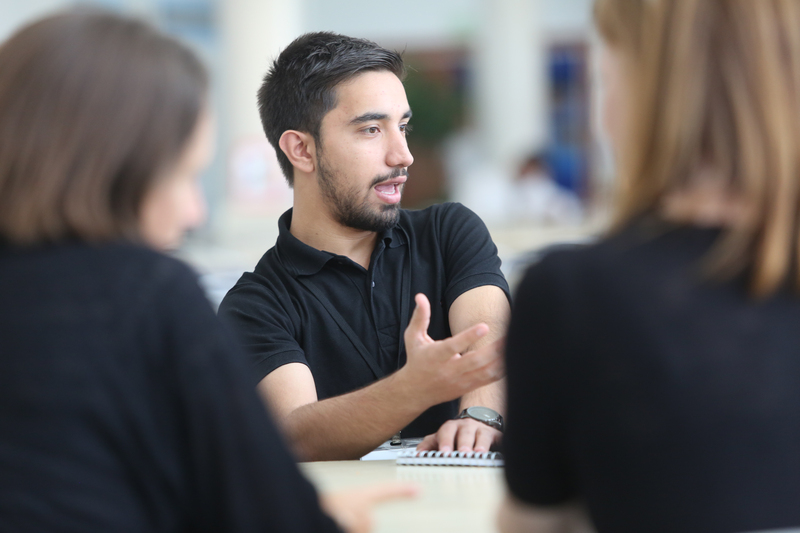 A resource hub can be a home of MUN initiatives with the hope of sharing our best practices. UN Gateway: Even though MUN delegates and organizers think or hope they are doing the work of the UN, they often aren’t. Even with good intentions, finding resources, or staying true to what the UN is doing can be challenging. Often UN resources are hard to find, or packaged in a way that make them inaccessible to the general public. 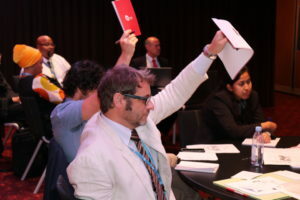 The MUN community would also like the UN to know what IT is doing, and to engage in a dialogue so that this army of delegates can mobilize to support the United Nations, particularly in advancing progress around the SDGs. In the months ahead we hope find that entry point, the place where that dialogue and exchange can take place. Face 2 Face Impact: We need to find ways to come together around IMPACT. Setting our different procedural rules and MUN cultures aside, we need to find places, events and programs where we can work together, to talk about MUN, but most importantly, to make IMPACT. In the months ahead, we will begin to figure out this important piece of the puzzle. It will be an exciting one! Right now we are starting where all movements need to start-at the beginning. We invite you to join us and others who are already doing great things and using Model UN to make a real difference in people’s lives. Follow us on social media, use the hashtag #MUNimpact, and sign up here if you’d like to help us in growing this movement. Thought Leaders Working Group, committed to making #MUNimpact a reality. 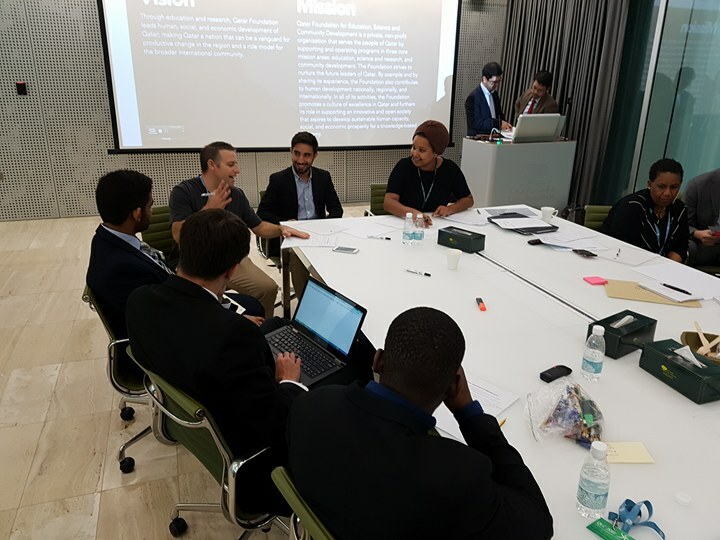 Carried forward by the positive momentum of #QLC17, two dozen MUN thought leaders, educators and representatives from the United Nations met at Qatar Foundation’s Headquarters to discuss best practices around the idea of Model UN as an impactful and engaging activity, and to formulate a plan that would allow for a new community to develop around that IMPACT. Lively discussions emerged as participants grappled with how to define impact as evidenced through MUN engagement. It was also an opportunity discuss related topics that often become part of larger discussions around MUN: is it elitist, can it be made inclusive, and is there a way to bring different types of MUN under one community and find areas of commonality instead of focusing on differences. In addition to thought provoking discussion, participants were treated to a visit to HQ’s 8th floor viewing platform, providing some incredible views of Education City and some pretty awesome photo ops. Qatar Foundation’s impressive and inspiring Headquarters, designed by Dutch architect Rem Koolhaas, was a fitting venue to bring together such a distinguished cohort of MUN leaders, pushing new boundaries and conceptualizing a new direction for MUN engagement and impact on a global scale. 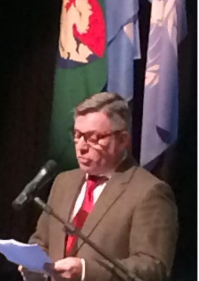 Alan Meidinger is currently acting as the co-chair in THIMUN Foundation. His passion and consistent participation in conferences around the world have put him in quite the unique position. His perspective into a conference such as QLC may be unmatched. Speaking on his role in THIMUN Foundation, as well as some moments from QLC that resonate with him, he is providing incredible insight into this conference. Could you tell us a little about your experience in the THIMUN foundation? I joined the THIMUN Foundation in 2004. I was at the time, and still today the only History and Geography teacher of the Board. My fellow colleagues are more linguist teachers. Almost every year I propose to the Board the theme of the conference to come, theme rephrase by my native speaker colleagues. I am in charge also of the Tuesday Cinema Evening during THIMUN The Hague. With the help of Irene Crépin, THIMUN managing director, we look for a film or a documentary relevant to the film. Furthermore, and following my 2nd visit to Doha during the Film Festival, I proposed to the Board 3 years ago to start in The Hague a World Photo Exhibition and Photo contest.. 2018 will be the 3rd exhibition. Last but not least. I organise workshops on MUN. I went to Singapore in 2005 and 2006, Montevideo in 2015 to promote amongst teachers all the benefits of MUN and THIMUN. QLCs 2016 and 2017 are new workshops for the French committees. You’ve been a part of QLC for a few years now, how do you think it has changed? QLC ’17 will be my 3rd participation. QLC has moved from the Qatar Academy where I went the first time to the National Conference Centre. This move have made the conference already very professional to a landmark in the history of the THIMUN Foundation. It attracts people from all over the world, sharing their experience. It is also a vast network of students, teachers and professors alike. 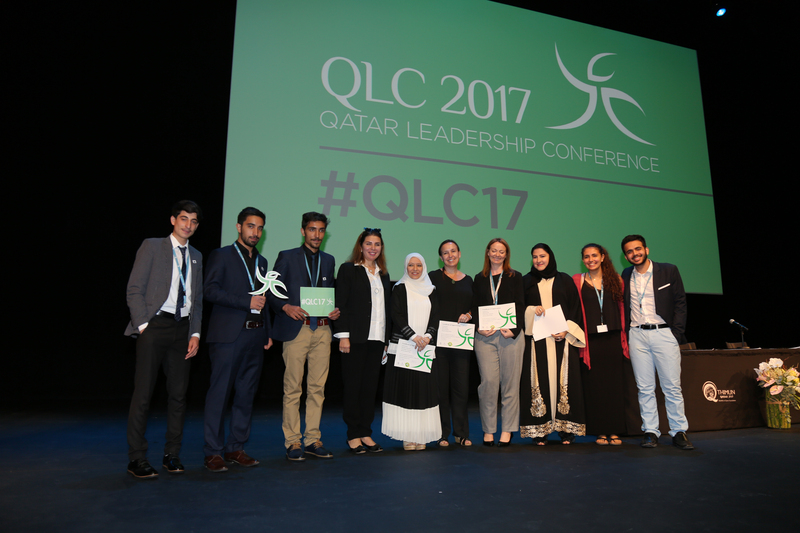 Thanks to Cameron Jansen then Lisa Martin, QLC has been shaping the Middle East leaders of tomorrow. What do you think is the value of MUN in multiple languages? The United Nations has 6 official languages [Arabic, Chinese, English, French, Russian and Spanish]. It is more than obvious to me that MUN conferences in these different languages must be promoted. I am French and try to promote in Europe, Africa and in Qatar French MUNs. 2018 will the 14th session of our French MUN called Modèle francophone des Nations unies in The Hague. Since its creation in 2004, MFNU has supported the creation of other conferences especially in Egypt, France, Morocco, Turkey. 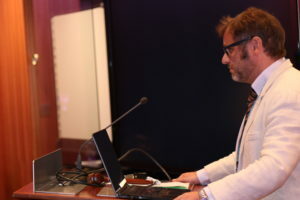 I organised workshops in Casablanca and Istanbul. I am in contact with French Politic Sciences University in Menton, next to Nice, where a multilangual conference is organised every year at the end of March [Arabic, English and French]. 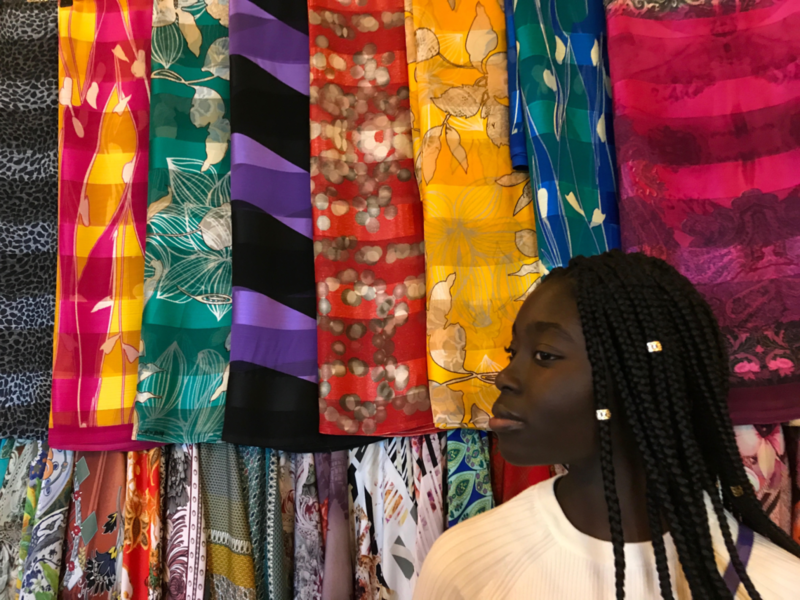 Our MFNU attracts now schools coming from Belgium, Bulgaria, Benin, Denmark, Germany, Greece, Luxemburg, Niger, Nigeria, Spain, Tunisia, Turkey, UK. If I come to Qatar is because there is strong demand of French MUN in the region. 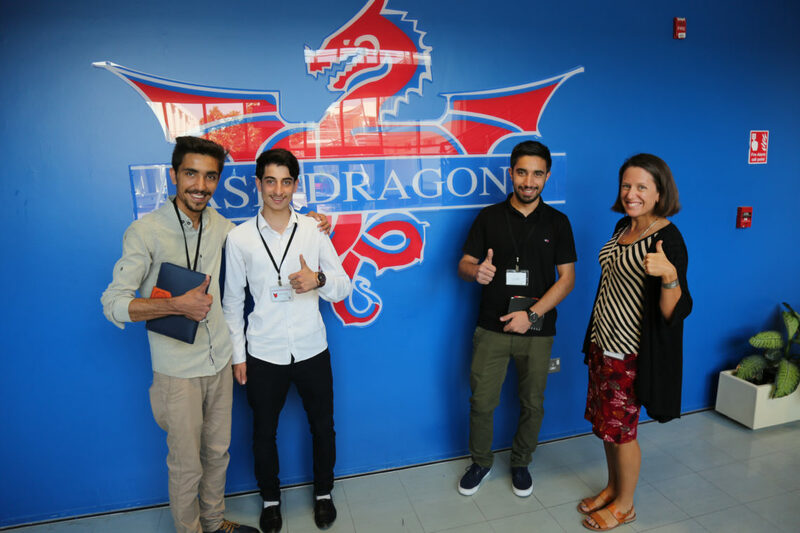 With the support of Lisa Martin and Samia Zakaria from Lycée Bonaparte in Doha, we have launched last year the first French Committee. At TQ’18 there will be 2 and they are fully booked. 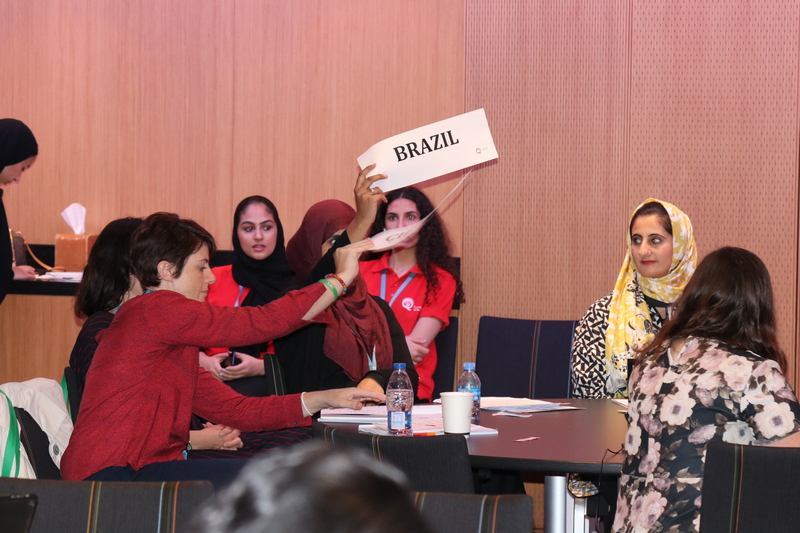 All in all, MUN conferences in multiple languages allow more students to participate in this activity because we tear down the language barrier. MUN is a strong and powerful member of the Civil Society, the more members, the better the world will be govern in the future. Are you looking forward to anything in particular this QLC? I am always looking forward to meeting new people, presenting other views, other perspectives. I might not be always in agreement but it is important to listen to others in order to better understand the world we live in, and selfishly to better understand who I am. I am also looking forward to seeing friends coming from other parts of the world to share views, projects. What excites you about coming to Doha? Next to QLC’17 I love modern architecture, museums… I haven’t seen yet MATHAF and I know that I will need to come back to Doha to visit the National Museum realised by French architect Jean Nouvel. Malak Elmoh is an International Politics major at Georgetown University, passionate human rights activist and Qatar International School graduate. 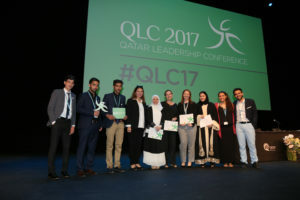 This experienced QLC presenter has always been enthusiastic about advocating for human rights; she has served as her school’s MUN Deputy Secretary General and has diligently volunteered in multiple organisations. 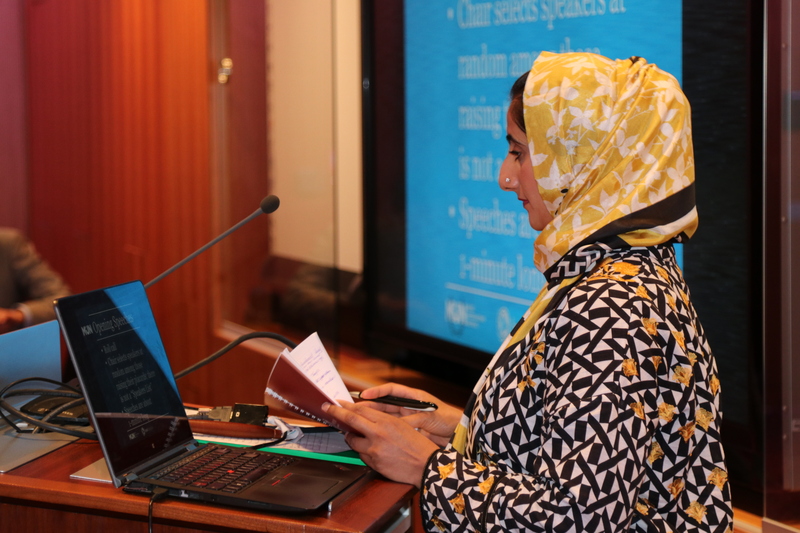 After the success of her workshop ‘Women in Arab Societies: An Unconventional Standpoint’ at QLC last year, she returns with her guide to university preparations, created specifically for students worried about the process: ‘The Virtual Handbook to Preparing for University’. Are there any essential skills you picked up during your involvement with your school’s MUN? How have they helped you over the years? Yes, there are quite a few actually! After years of being both a delegate and a chair, I saw such a sharp turn in my character altogether. Now don’t get me wrong, I’ve definitely always been a pretty outgoing, talkative person. However, it’s the maturity and clarity that I began to speak with that I owe to my involvement in MUN. It’s experiences like this which mould you into a member of a society who can actually CONTRIBUTE. The ability to outspokenly deliver a point to the table, whatever the situation, I see as one of the greatest strengths one could have. This, henceforth, aids in being a person who can easily adapt to different situations. Having taught and worked one-on-one with the students who were involved in my school’s MUN club, I also amplified not only my communication skills, but my leadership skills too. It’s these skills which have ultimately helped me obtain all the different opportunities I’ve encountered in my life. Your workshop this year is titled ‘The Virtual Handbook to Preparing for University’. What are some of the difficulties you faced while applying for university and how did you combat them? You’ll have to attend my workshop to hear the full story! I can, however, give you a few sneak peaks. I think the biggest struggle was definitely ‘attempting’ to juggle my academics, social life, health, extra-curricular activities, the applications themselves etc. But luckily for other students, my workshop is going to provide some tips on how to combat this! What was it like stepping into university for the first time after all your efforts? It definitely felt surreal to finally embark on a journey that I had been working tirelessly towards for years! Orientation week felt like a blur, honestly. It’s one thing to get a university acceptance, but it’s another to actually, finally, attend. I have no shame in saying that I was, and still am, so proud of myself for having made it this far. It also lifted the massive, MASSIVE weight of whether or not I’d have somewhat of a future, off of my chest too. Was choosing your major difficult? What sparked your interest in International Politics? It’s a well known fact that I’ve ventured and showed interest in every field throughout the entirety of my high school career. Therefore, I wouldn’t necessarily say it was difficult, just that it was quite a prolonged journey. However, what primarily sparked my interest in International Politics was my unshakable passion for current affairs and ever-changing world of politics. We live in a time where access to the world’s happenings is at our fingertips, and by indulging in a degree which widened my opportunities of being more engaged and aware of the world and its happenings, I have developed an even stronger passion for this field. What made you want to come back to QLC after your first workshop? I absolutely adore QLC and the concept of it. It was undoubtedly my favorite conference of my high school years. After all of the positive feedback after my first workshop, I knew that I had to undergo the experience once again. It’s great to work one-on-one with students and to hear some of their amazing ideas and opinions and LEARN from them too! I knew I couldn’t pass up the opportunity of attending the conference even though I’ve left high school, so here I am! Finally, what drives your passion for women’s rights? Although, I am lucky and blessed enough to have access to so many wonderful opportunities, like my education, I know this isn’t necessarily the case for a lot of other women. I feel for all the women in this world who are put at a disadvantage just because of their gender. Nobody, no matter who they are and what category they fall under, should be deprived of their basic human rights. The debate can rage on for as long as it wants, but at the end of the day, women’s rights are basic human rights. The confusion towards this notion is what ultimately motivates me to keep vocalizing this necessity for all women to have access to these rights. 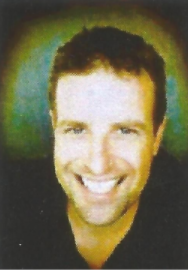 Sean Robinson is an educator who has been involved in many motivating global projects and organizations. Creator of Connections-based Learning and co-founder of Connected Learning Partnerships, he has connected with educators around the world to advance technology and teaching in order to make the education system more meaningful. 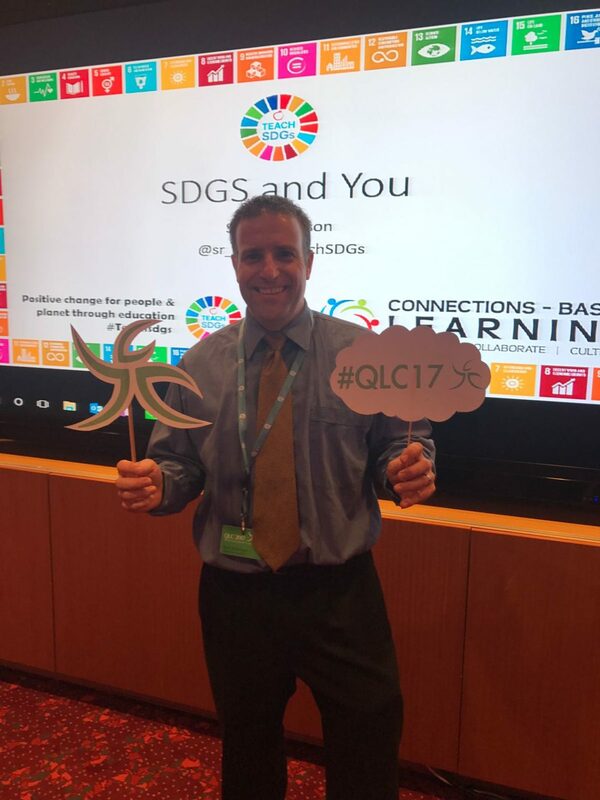 This year at the QLC, Sean Robinson will present “SDGs and You,” which will be about the UN’s Sustainable Development Goals and how every one of us can help achieve their goals. His conference will teach us how to make a difference by collaborating with other people to abolish poverty, establish equality, and promote peace. What inspired you to achieve your goals and passions? Years ago, I went to an international educational technology conference with many questions. The questions were around apps, technological platforms, and ideas to incorporate technology in my teaching. Though the conference had many workshops with many answers, I was more taken with the conference attendees. Connecting with amazing educators from across the planet opened my eyes to new questions. They weren’t around good technology but meaningful teaching. I went back to my school and began a pursuit of meaningfulness, allowing my students to be involved in meaningful projects, giving up control, allowing for reflection, autonomy, and collaboration. When I did that, I saw two kinds of projects occurring: insular self-serving ones and connected other-serving ones. I have devoted my life to facilitating the latter. What accomplishments or projects have you done in the past that relate to your interests? Creating an approach to teaching that is based on connections is my life work. I’m just finishing a book on Connections-based Learning that outlines the approach and gives many examples as to how teachers can use CBL to increase meaningfulness in their teaching, which has caused me to take action on many initiatives. Whether it’s co-founding widespread platforms to help teachers connect in Connected Learning Partnerships or creating an atmosphere in my classroom to help students battle light property or water scarcity, I continue to press into the approach and help others to do the same. How has presenting at the QLC or any other conferences benefited you? Conferences, for me, are all about connecting with the people. 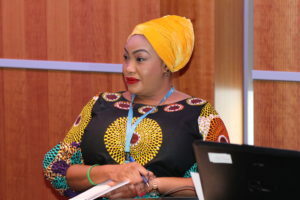 The preparation for this conference has been amazing as I gather stories of students around the world working on the Sustainable Development Goals and connect with champions of gender equality. 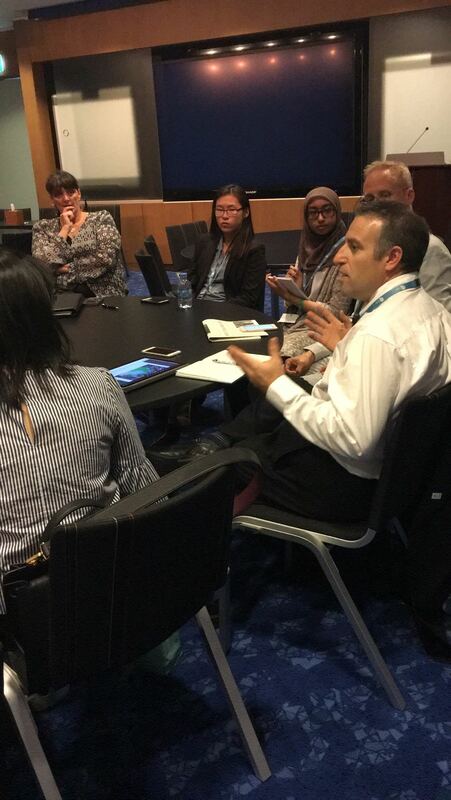 But more so, I count it a privilege to be able to meet with students and educators from around the globe during the QLC. What a great opportunity to mutually benefit each other’s work! What effect on the audience do you hope to achieve after presenting at the QLC?? My desire is that my presentations inspire my attendees to make a difference. Whether it is working alongside some of the initiatives I share, creating their own initiative to help achieve the Global Goals, or making a change in lifestyle regarding gender equality, I hope to motivate my attendees to take further steps on the road to lasting change. Why do you believe the topic you’re presenting is so important? Why does the audience need to know about your topic? My topic causes us to look at the fundamental need of humanity. As the UN gathered both in 2000 and 2015, they agreed on what we really need to focus: goals that better the globe. As I share stories of people like you and me making a difference on the Sustainable Development Goals around the world, we can be inspired to help them and to do the same. Be prepared: I will beckon my attendees to take action. Copyright © 2019 THIMUN Qatar. All rights reserved.